Humans are literal creatures; we want to see proof that something has worked in the way it was advertised before we purchase it. This is so ingrained in our brains that every culture has some version of the above sayings. And this desire for proof holds whether we’re considering buying a new phone, a pan for our kitchen or business software that we’ll use at work. This need for confirmation before purchasing is why there are more than 2 million ‘product testing’ videos YouTube, and why customer testimonials are the strongest tools in a company’s sales and marketing arsenal. In the business world, when you have that proof of how well your solution works, it’s the catalyst that helps your company start jumping ahead of the competition. Because happy customers who have seen success are the best way to attract other happy, successful customers. So you can imagine how thrilled we were to have our customer Cornerstone OnDemand present their success story during the recent SiriusDecisions Technology Exchange Conference in Austin. Tracy Strauss, the senior director of demand generation at Cornerstone, spoke to attendees about her journey to predictive, starting with her initial desire to find a solution that would help her align marketing and sales in order to scale in an efficient manner. She determined that deploying a predictive marketing solution in conjunction with an account-based marketing strategy was the fastest way for her team to start reaching the growth goals that had been determined by the company. Tracy had some ups and downs as she rolled out these programs, and during her presentation in Austin she discussed how the first predictive vendor she chose turned out to be a bit of a nightmare. They gave her what they’d promised – a nice model in 3 weeks – but after it was deployed she realized that the model wasn’t actually addressing the issues she was facing. Her teams needed a way to prioritize inbound leads, and a way to strategically target key accounts in conjunction with sales for outbound activities, and the model her first predictive vendor provided wasn’t providing support for either of these needs. All of this brought Tracy to Lattice Engines earlier this year. Since we kicked off our program with the Cornerstone team, we’ve been able to build out inbound models for them, as well as help them determine which accounts were the best fit for their account-centric activities. 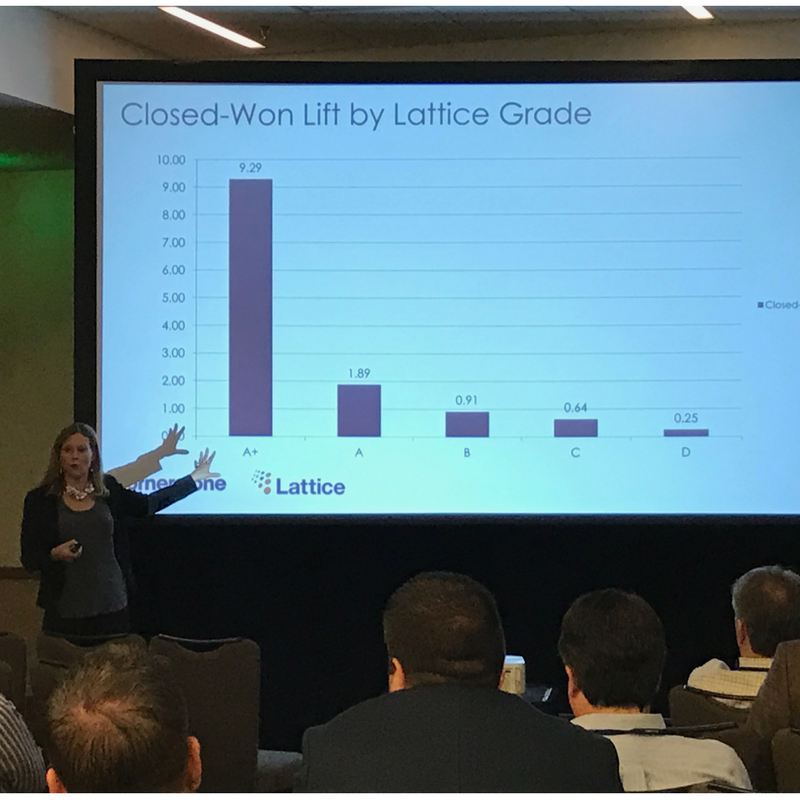 Through all of this, Cornerstone has seen some great results, with a 4x increase in opportunity lift, and a 9x increase in closed-won opportunities since implementing Lattice’s predictive insights platform. And Tracy’s not done there. She and her team have plans to work with the Lattice team on a number of other areas, such as creating models for her customer base and enriching databases with account indicators, which will further increase the efficiency of her sales and marketing activities. We can’t wait to see what kind of proof points she comes up with next!